Marketing departments use trailer houses to make the promos for their film and there’s a huge amount of time and effort put into them – some take as long as six months to put together. Because they are essentially adverts, they are – like most advertising – about the hard commerce. They’re crafted to hit the right emotional buttons and get you to engage with their new product, even if it effectively ruins the plot. The process used to be straightforward. Someone like the late Don LaFontaine would do the voiceover with his trademark, gravelly voiced, “In a world…”, “In a time…”, “There was a man…” or “Now, more than ever…” clichés. This would be accompanied by some overwrought film score, a few clips to set up a premise and the date it was going to be released. Now we’re seeing the entire film condensed into 90 seconds. 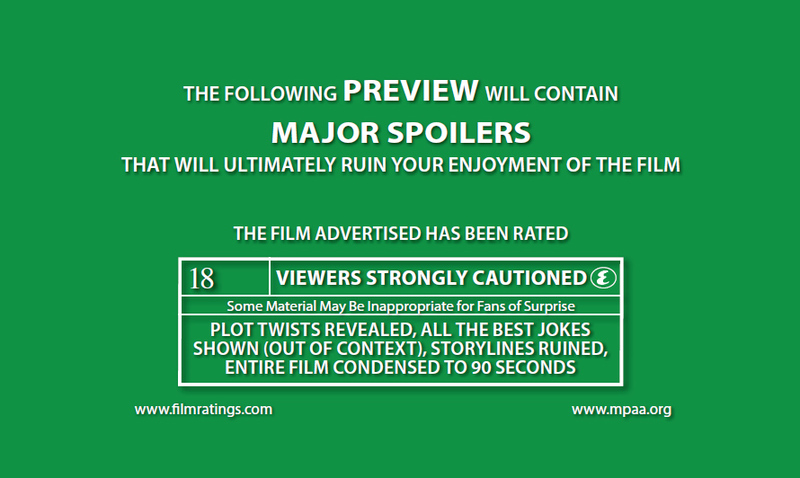 The Rise of The Planet of the Apes’ trailer does this and it kills the suspense. Although far worse was a recent re-release of the original where the DVD cover is an image of Charlton Heston on his knees in front of the Statue of Liberty. (“You maniacs! You ruined the ending! Goddamn you all to hell!”, etc.). If you re-watch the trailer for Forrest Gump, it’s pretty much the entire film condensed into three minutes. Or a “fast once-over” as veteran film critic Roger Ebert calls it. “When you see a trailer, you don’t realise how much is being spoiled, but when watching the movie you realise you already know what’s coming next,” he points out. This is why fellow critic Gene Siskel always made the point of leaving the room during the trailers so as not to ruin his enjoyment of the films. Some are clear spoilers. The trailer for recent CIA thriller The Double gives away such a huge plot point it effectively ruins the film. Cast Away’s trailer shows that Hanks gets off the island; The Island’s trailer reveals a key twist; The Last House On The Left (2009) and Final Destination 5 are all ruined by key death scenes being given away. Admittedly some trailers are done pretty well. The teaser for The Dark Knight Rises sets a tone, peaks interest but doesn’t reveal too much. Likewise, the first trailer for the English version of The Girl with the Dragon Tattoo is extremely creative: it has a cut on every beat of the music (a cover of Led Zeppelin’s “Immigrant Song”) and crams in 170 cuts in less than 100 seconds. It sets a tone so you know what to expect without giving away what you’re going to get. But 90 percent of trailers are detrimental to your enjoyment of the film. Try avoiding them for a few months and see how much it improves your movie experience; often, the less you know the better. And of course, there’s the other consideration of the increased expectation effect that a trailer creates. Remember how people were wildly excited when they first saw the trailer for The Phantom Menace? Look how badly that turned out. Skip the trailers, save the movie. ← How much money do you need to be in the one percent?